Here's executive fastback coupe produced by the Italian manufacturer Alfa Romeo, it's a Gran Turismo come with SOHC V6 2.5 L engine, known as GTV6 series built in 1986. The GTV6 was a very successful racing car, including winning the European Touring Car Championship four years in succession, as well as many other racing and rallying competitions in national championships as France, Italy, and Australia, also known as the king of World Rally Championship (WRC) in tarmac rallies on 80's. This rare twin turbo Alfa Romeo GTV6 Callaway 1986. There are few of these around, and this one has been fully restored in top end quality with over $110,000 (Approximately €80,000) spent on its restoration! The car has the paperwork for ever step of the restoration work carried out. The entire motor was rebuilt by Greg Armstrong. He is perhaps the worlds most highly regarded turbo specialist. Lambo hired him to design and implement the turbo systems on the Diablo. He also has a long time love affair with Alfa Romeos. He did the restoration on the very first GTV6 Callaway in 2002. He had this one from 2006-2009 when he completed rebuilding the motor and turbos. He gold cladded a lot of the finer parts and nuts and bolts to withstand the heat generated by the turbo. The Alfa Romeo was shipped to England where it was improved by Alex Jupe of Alex Jupe Motorsport. There are receipts included totaling 23,000 GBP attesting to the amount of additional work done by Alex including the sport suspension components. Replaced the GT bodykit with a period correct very, very rare Zender kit found in Scotland. Replaced stereo with an Alpine navigation system, speakers, amp, and woofer. 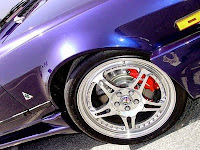 Custom HRE wheels at a cost of $6,500 USD. Custom exhaust system designed and installed by Magnaflow, Costa Mesa California.